Burnout Drift is an interesting racing game developed by PACOGAMES. 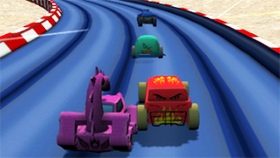 This game has unique 3D graphics, suitable for who loved racing game. You can experience this game on your browser because it is a flash game. In this game you will be stunned by the cars that the game offers you. There are 12 super cars from racing cars to huge trucks... However, you need money to buy these super cars. The interesting point in this game is that you can drift whenever you like. The more drift you have, the more money you will have. You can freely customize your car. You can change the color of your car (there are 9 colors for you to choose), you can buy new wheels, you can customize the camera, and headlight colors, wheel smoke colors ... Of course, you need money to do these things. You can use Nitro by pressing F key.